The story of a son’s spiralling descent into alcohol addiction and the effects on one ordinary family and their fight to save him. 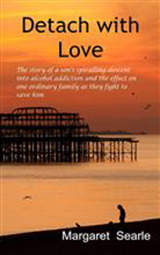 Detach with Love is on sale as a paperback or e-book and available through all major retailers. At first I was a little nervous about reading this beautifully written account of David's life and death. Only because I felt it would be an intrusion, as I am a friend of Louise. I found it to be one of the most heartfelt books that I have ever read, and can't begin to imagine what Margaret and her lovely family went through. Reading this book gave me a slight insight and I pray to God that I never have to go through what they went through. This excellent book gives a first hand insight into the challenges families and friend are facing when a family member becomes addicted to alcohol. Even though I am working in the field of addiction for more than 15 years this book was very useful to me, not least to recognize how little expert support is out there for families. I suggest it is a must for all those working with individuals with addictions and their families and friends. It doesn't seem right to review this book with five stars as "I love it" bearing in mind the traumatic subject it covers. It was however a very good account of what must have been a terrible time in the lives of these parents and all their children. It was very readable which, as a book designed to help other people through the same crisis, is only a good thing. Would totally recommend it for others in the same situation. It’s unbelievable how little help there was for this family and their son. I feel for the author and her family. Losing a child must be a terrible ordeal but watching them die like this must be beyond terrible. The people that were involved in East Sussex should be made to read this and see what the consequence of their actions were. Then they should ask themselves some serious questions. It is beyond me how people like this can cope with losing their child in such a way. They must be very brave. This is a really shocking account of how alcohol ruins not only the life of the user but the family also. This book will stay in my mind for quite a while. This poor brave lady and her family had to go through a horrendous ordeal and this book really draws you in and feel their every frustration. It must have been heart breaking writing this story and reliving the memories so that others can read and learn from this book. A book certainly to be recommended. Moving and heart wrenching book about a families struggle with alcohol addiction - a true testament to a mother's love - must read – particularly for all those that work with addicts! A harrowing and eye opening account of a young mans struggle with alcohol addiction told by his mother.